26 And they slew Hamor and Shechem his son with the edge of the sword, and took Dinah out of Shechem’s house, and went out. This horrific incident is explained very differently in the Diamant’s fictional retelling, as are many other familial incidents, from Dinah’s point of view. The rivalry between Rachel and Leah, the rivalry between Jacob and Esau, and the rivalry between the sons of Joseph, Dinah’s younger brother, are rich with detail and dialogue. The sparse accounts given in the Old Testament are fleshed out in this compelling narrative, with the women center stage, a striking contrast to the male-dominated biblical text. Carol: There are certain books I just can’t put down. Laticia: Seriously, I’ll read until like three in the morning . . .
Carol: Like The Red Tent! There are about 20 copies of The Red Tent on the class independent book cart, all purchased at book sales for $1.00 each. Picador USA publishers produced an oversized text, about 2″ taller than a standard trade paperback; on the AP English Lit book cart’s top shelf, these copies stick out. The cover art, designed and illustrated by Honi Werner, is also eye-catching. Students always pick up the book with interest. “What’s this about?” one asks. “Read the back,” I reply. How else to describe a story that centers on celebrating the onset of womanhood? 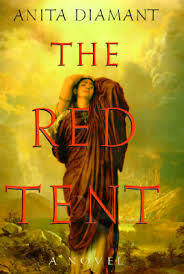 Students who choose to read Diamant’s The Red Tent will certainly want to return to the beginning to explain how Dinah’s life story begins and ends with the women who loved and supported her. They will also have had a “crash course” on the Book of Genesis, which is the source of many other literary allusions. While The Red Tent is not great literature, this novel sets many female students looking for equally compelling contemporary novels about women, with or without that “chick book” label.